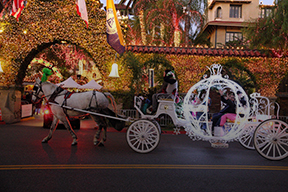 Southern California's signature event The Mission Inn Hotel and Spa Riverside Festival of Lights welcomes guests to experience holiday lights and decoration, live entertainment and lots of goodies in Downtown Riverside. 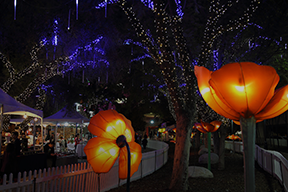 The Riverside Festival of Lights is a time-honored tradition for generations of Southern California residents. Attractions at the Riverside Festival of Lights include the Artisans Collective, lighted displays, rides, entertainment, food vendors, Santa Claus and much more. 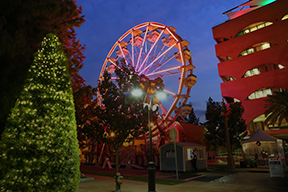 Add a little excitement to your visit to the Riverside Festival of Lights with live music and dance at the University Stage and the Ben Franklin Stage across from Santa’s house. Come join the celebration at the Riverside Festival of Lights. Discover Festival of Lights hours, how to get here, where to park and what to do through our schedules and maps. Find out about attractions, entertainment and special events during the festival. See and share what is happening at the festival through social media, photo gallery and media updates.